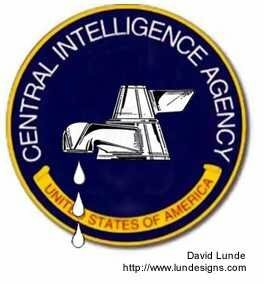 Flopping Aces has a good round-up of the CIA mole story. The mainstream press are downplaying this for the moment since it involves them and not in a good way. They've been caught fencing stolen goods and are using the, it-fell-off-a-truck, defense. It seems a long time analyst formerly with the NSA (No Such Agency) who now works at the CIA confessed to being a double agent. She was secretly working for ..... wait for it ..... the Democrats (!) leaking memos here and there which the press would use to embarrass the current American Government. She donated 5K to the Democratic party and 2K to John Kerry himself. You couldn't make this stuff up. This is like the Dirty Harry movie where five cops in the San Francisco Police Department execute their own agenda. I wonder if she worked alone? Mary McCarthy moved to the CIA’s inspector general’s office and promoted herself to decerner of good and evil. She's appears to have sold out her honour and perhaps country for Howard Dean and Hillary. How'd you like that on your resume? They haven't said it was her, but the single most damaging memo leak was the info about the NSA listening to cell phone calls from overseas. That did lasting damage because the bad guys stopped using the things after the idiot-press told them about it. A free press is also free to act responsibly. It would be nice if they'd exercise that right once in a while. The best part of this thing is yet to come; how was she caught? Was it a sting as Rightwing Nuthouse suggests? She is extremely high up, at the level that initiate such investigations. This could be Blunt and Philby American style. We're used to hearing about double agents working for the KGB or maybe even SPECTOR but the Democrats? Someone call Tom Clancy; though I can't see Hollywood optioning this one. Update: Allah Pundit has a great primer on Mary McCarthy's career.